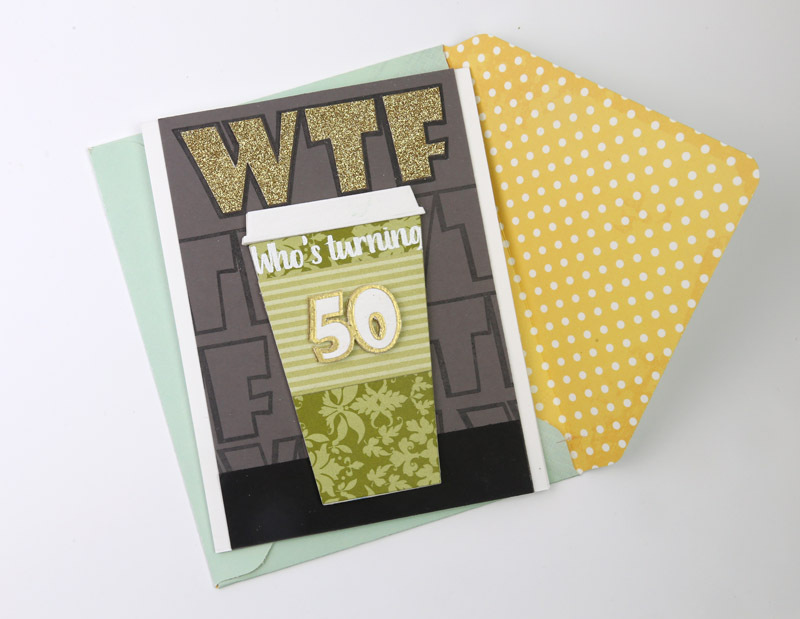 Happy 50th (what?!?) to Michele! 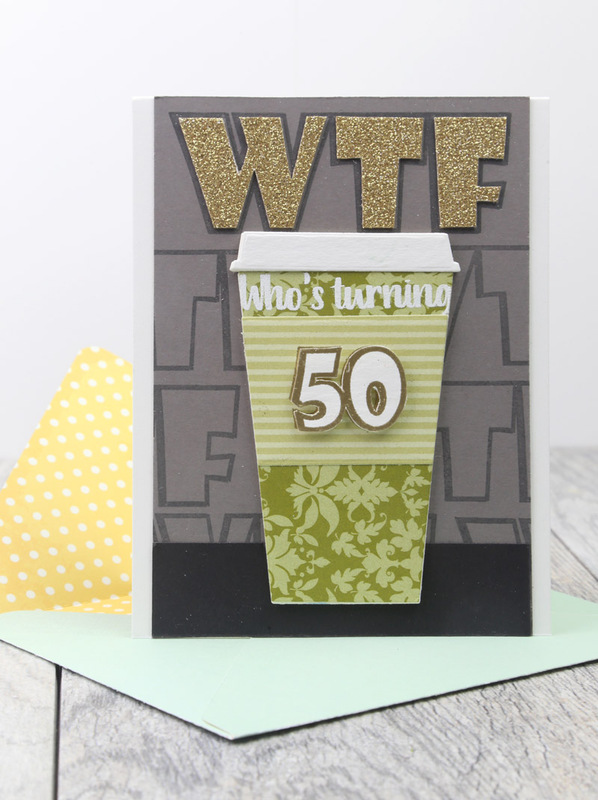 Welcome to the fabulous fiftieth birthday hop for my friend Michele Gross, a.k.a., CAS-ual Fridays founder, owner and designer extraordinaire! You may have come from Irit Shalom, but if not feel free to jump to the beginning of the festivities at the CAS-ual Fridays blog. Here we are in January at Creativation ... umm, where is the fifty-year-old?!? MAYBE fourty. I don't get it. Good looks aside, Michele is the sweetest around, so laid back, and has an edgy wit about her that makes her hilarious to hang out with. I am so happy and honored to help celebrate her fiftieth with my old teammates and friends. 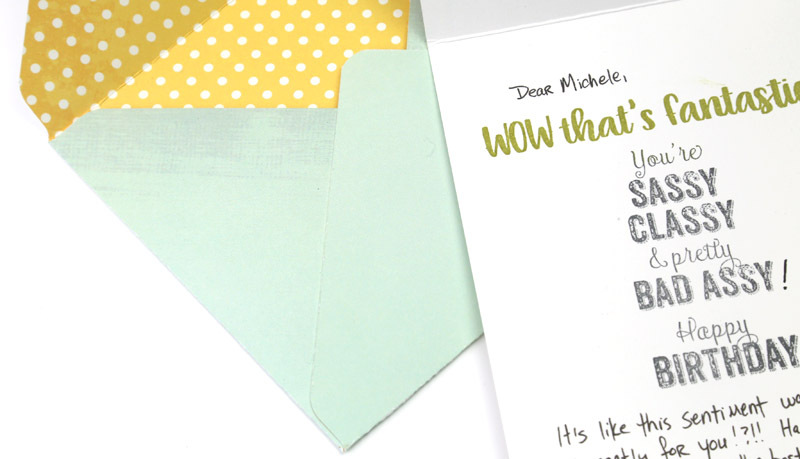 The card I made for Michele's big event just had to use her famous WTF 2 set, right?! 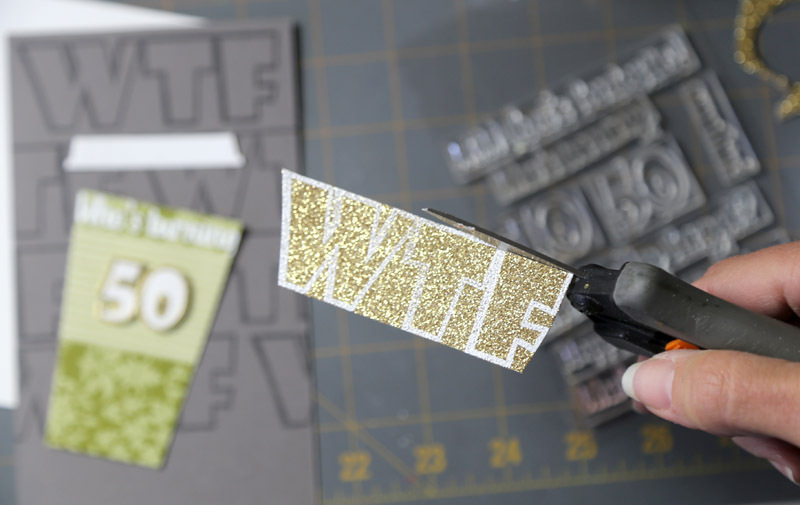 The original WTF was one of her first stamp sets five years ago, and it really made everyone take notice of this new stamp company in town. I also wanted to use one of her new coffee sets, and I've been dying to play with the adorable To Go Cup Fri-die. So there you have it, old and new ... almost sounds like this is a wedding shower for Michele! I die cut two additional coffee cups from my husband's thick comic book backing boards to layer underneath for some dimension, and then cut a third piece for the lid so it would stick out from the cup more. Just like in real life. I was super excited that the sentiment embossed on the cup itself just barely fit between the edges. At first I wasn't going to stamp it there because there weren't any margins left on the sides. But then after I looked at it more, it reminded me of when you see writing going around a cup in real life, you often see it going off the edge of your vision as it wraps around the cup. So then I ended up liking it even better without the margins. To help me cut the glitter insides for the letters I ended up embossing the outlines because ink would not show up on the uneven glitter surface. The background is stamped with a few more WTF's. 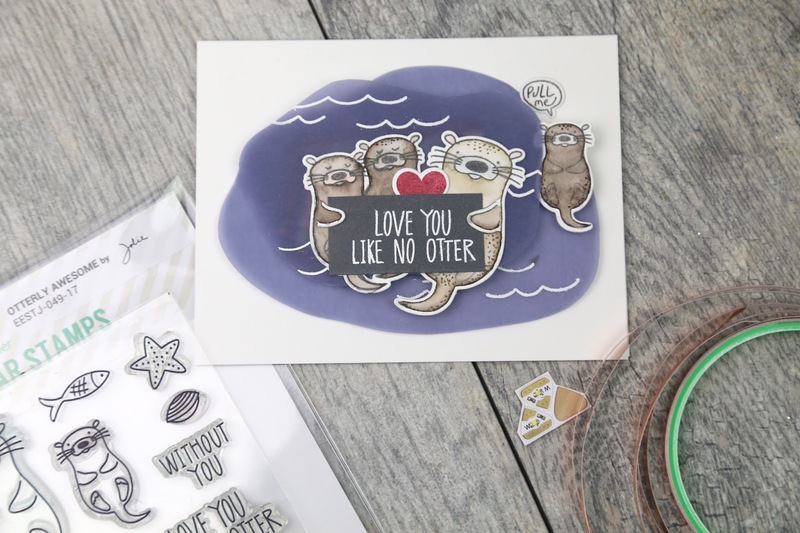 CAS-ual Fridays has the best sentiments for inside the card, so I ended up using three different stamps to customize my birthday wishes for Michele. The last two are from Frankly'isms and are just perfect for this occasion. 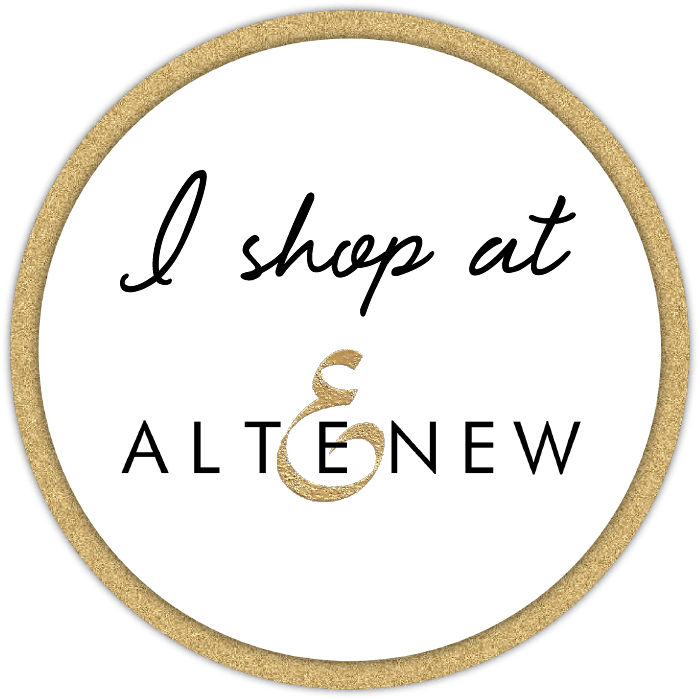 Michele will be giving away (5) $50 gift codes (WOW, can't wait for her 60th birthday party!!) from comments left at CAS-ual Fridays and the rest of the blogs on this hop. Your next stop is Susan White who is also wishing Michele a fabulous fifty. Thanks so much for stopping by! And a big happy birthday to you, dear Michele!! Hi Folks! I'm excited to share some results of my Spring cleaning with you on the Winnie & Walter blog today! 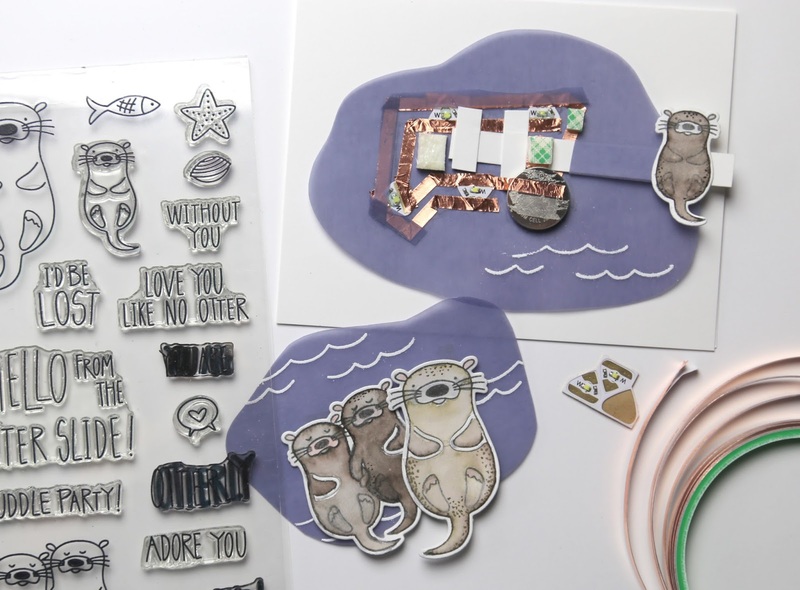 I deconstructed some gift packaging that I didn't want to get rid of and came up with this fun set of birthday cards. 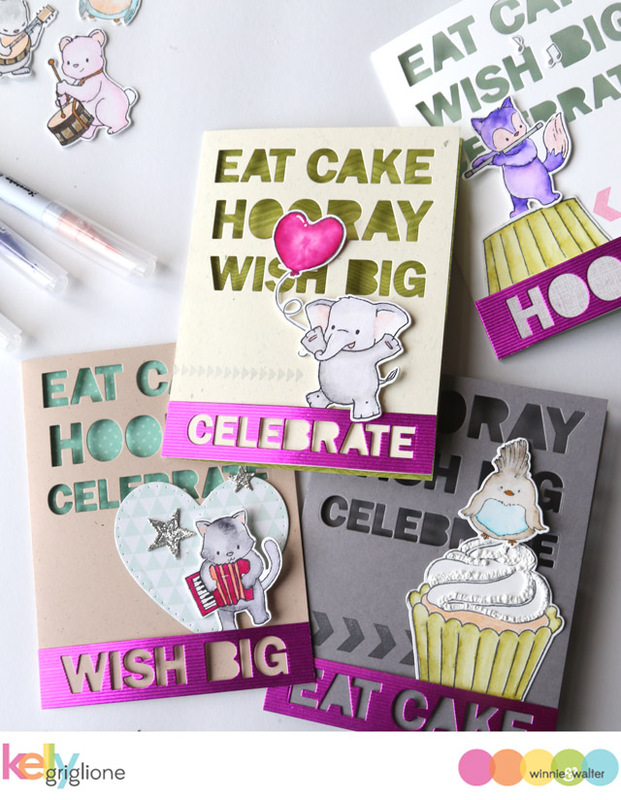 Everything from the card bases to the embellishments were sourced from my leftovers bin (except the cupcakes). Whoo-hoo!! It's a small dent, but it's a dent!!! Check out the full article at Winnie & Walter. Hi Folks! 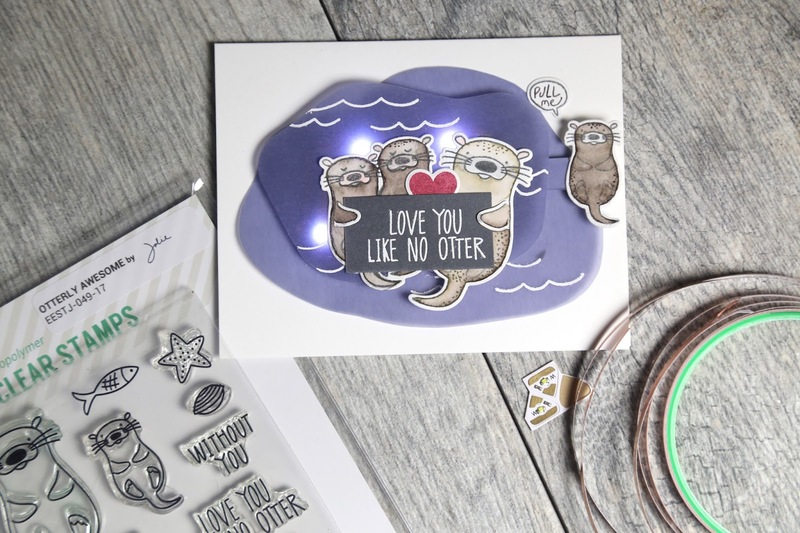 I get such a "kick" out of the light up cards, and am so thankful the fine folks at Chibitronics developed such a fun product to share with the craft world! My newest light up card is something I see just about every day at our house ... only instead of two ninjas fighting, it's two teen-aged boys wrestling. I'd like to think they'd face ninjas for each other! Here’s a little .gif showing the fighting action, just like in a cartoon! These little ninja guys from My Favorite Things are pretty darn cute, and now with the jump kicking, and the lighted impact action, they have really come to life! 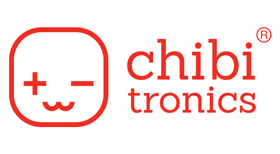 Again, I've got the full post on the Chibitronics Blog if you want to learn more about it and see how it was made. Thanks for stopping by! Hi folks! Hot Mess Lady is here! If you follow me, or others from the Ellen Hutson team, you may have seen some sneak peeks this week of the newest leading lady ... Hot Mess Lady by Brandi Kincaid! 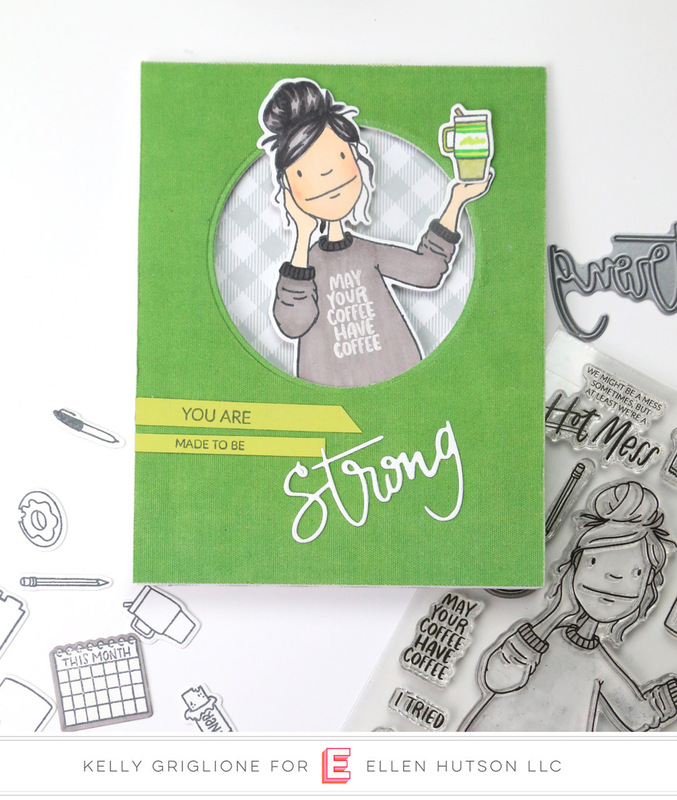 Hahaha, you can't help but grin while she's on your stamping block! I can so relate to her, right down to having my hair in a bun while I'm working around the house (or crafting). She is quite versatile! Aside from being a fun leading lady, she comes with a lot of different accessories, and sentiments. 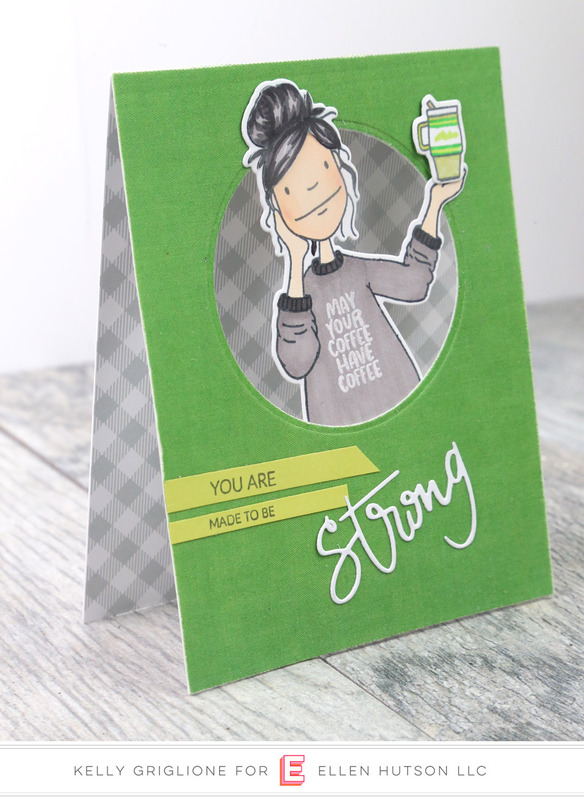 For this card I chose to have her hold the coffee mug because, well, seriously, check out the sentiment on her shirt!!! May your coffee have coffee. Hahaha! I just had to use that one. I do love that there are several different sentiments that are sized to fit the front of her shirt, and think that's such a smart idea. You can either use that space for a secondary sentiment, like I have here, or you can have that be your only sentiment. If you have a pretty full card, design-wise, it's a nice option to put the sentiment on her shirt and not have to find a different space on the card for it. 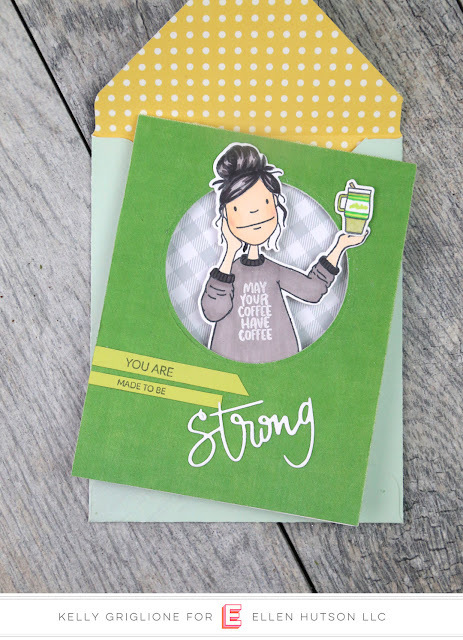 The circle window gives Hot Mess Lady a place to peek out from, and lets you see the fun gingham pattern from Lawn Fawn on the inside of the card. The main sentiment works well because it has a double meaning here. It can refer to the lady being strong, or the coffee being strong. And the fact that it says "made to be strong" fits even more with coffee. Love the word die from the Be Strong die set. Ta-da! She definitely looks ready to go out of the house now! All it took was a couple snips to give her a hair cut and remove the stray pieces of hair. She is totally transformed. Which is good, because I wanted her pull double duty and be a comic book star. Here are all the pieces. I freehand cut a cloud shape for the thought balloon from white and black cardstock. The starburst is cut freehand as well, and colored with a yellow copic. I decided it needed one more point on the top left so I cut another point and adhered it behind. No one will ever know since the thought balloon covers it up! Instead of cutting a second layer of black cardstock for the starburst I just outlined the edges in black marker. The nice thing about making a comic-based, or pop-art style, card is that you don't have to spend any time shading. Everything is a flat yellow, red, blue, green, etc. It also makes picking your colors out easy! 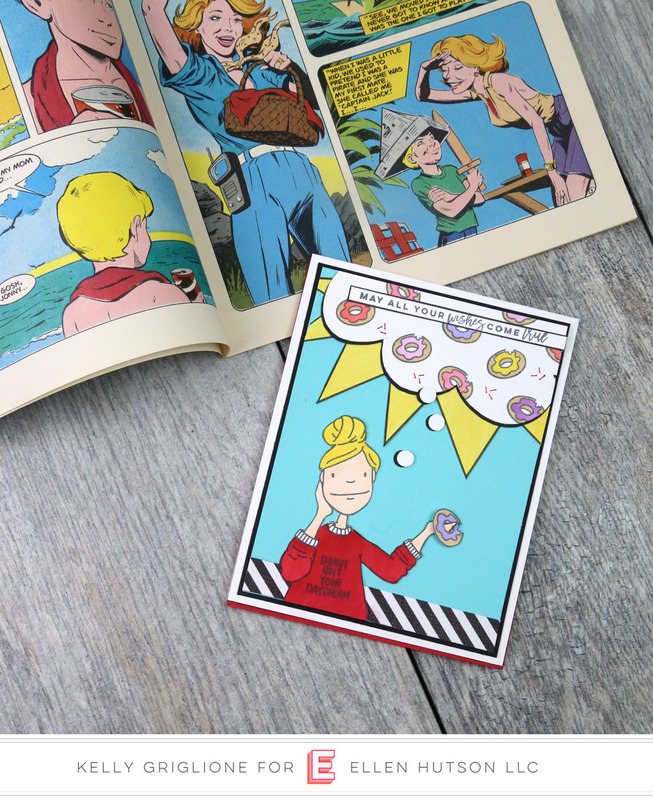 These colors fit right in with this Jonny Quest comic from the 60s. 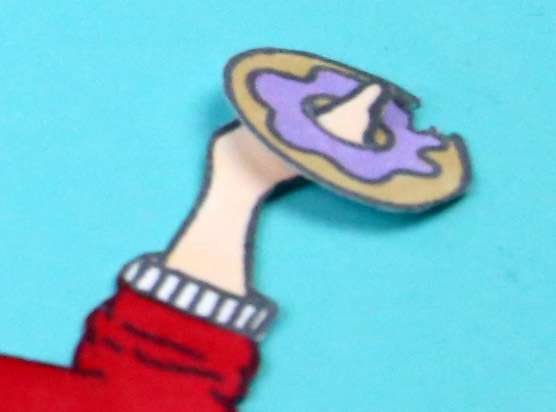 Here's a close up of Hot Mess Lady holding the donut. I just have adhesive behind her fingers to attach the donut to the card. I usually don't have more than one mat on my cards, but this one has a blue panel with a thin black mat on white cardstock. Again, to represent a comic book panel. 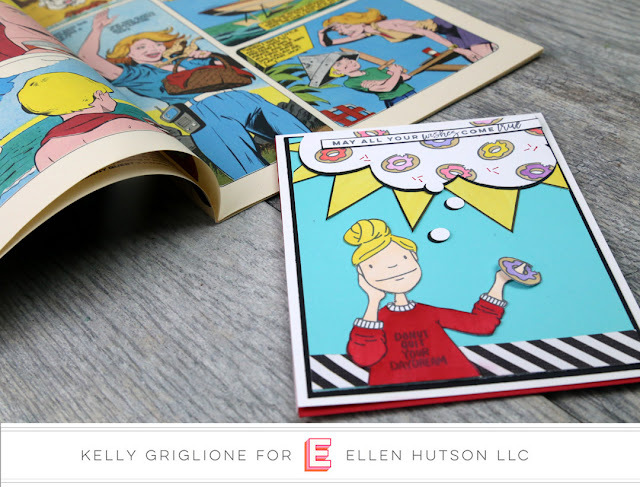 The inside is lined with red cardstock to further the comic book theme. 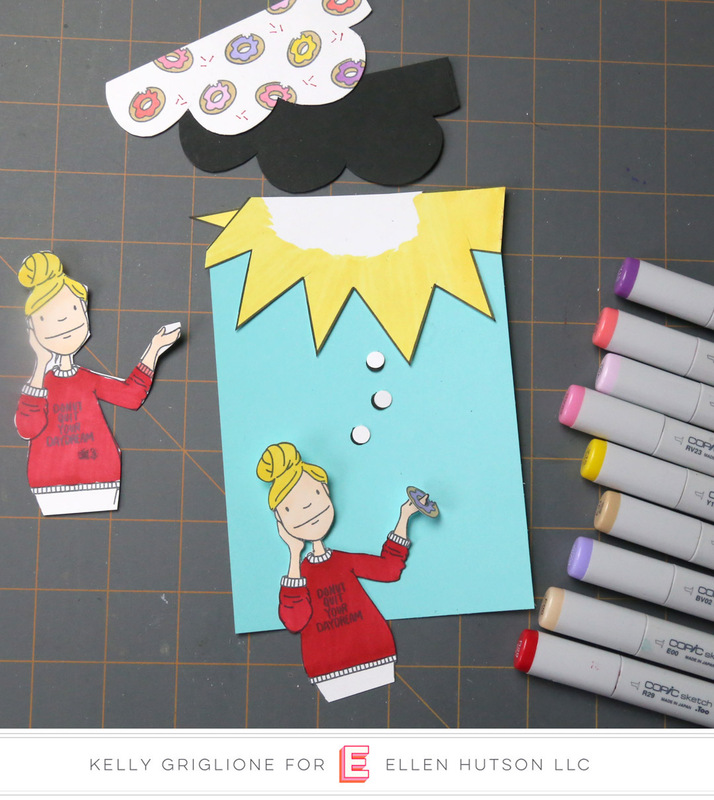 I'm pretty sure Hot Mess Lady will be getting a lot of use in my craft room. As you can see she's pretty versatile. Everyday Hero Lady by Brandi Kincaid is the other leading lady being released today. In hindsight, it's kind of funny that I chose Hot Mess Lady for the comic book inspired card, instead of Everyday Hero Lady, since she actually LOOKS like a comic book hero, with a cape and everything. But who wants to take the easy route, right?! 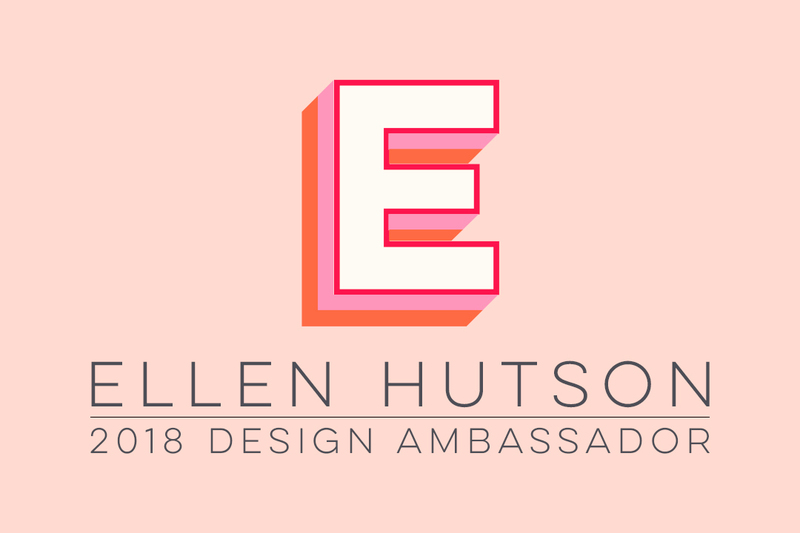 More inspiration awaits in The CLASSroom, where some of my teammates have shared cards they've made with the Essentials by Ellen April release. Best news is that the release is available right now! Hi Folks! Each month at Winnie & Walter we feature a previously released set and host a challenge (either with that set, or something that inspires you from the featured projects). 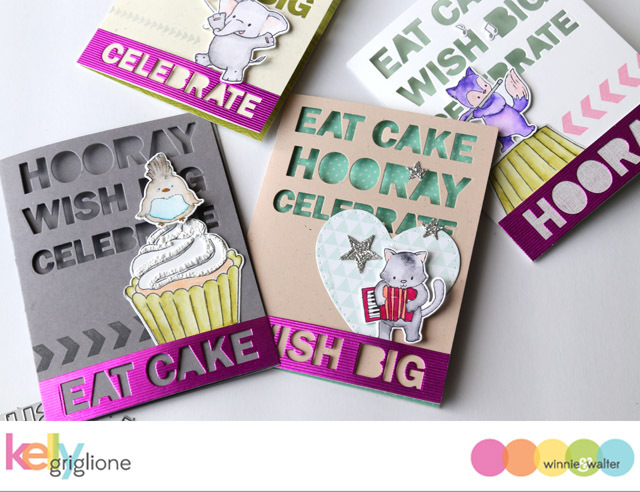 This month we're featuring The Big, the Bold and Baby with about a million little words you can put together for your baby cards. 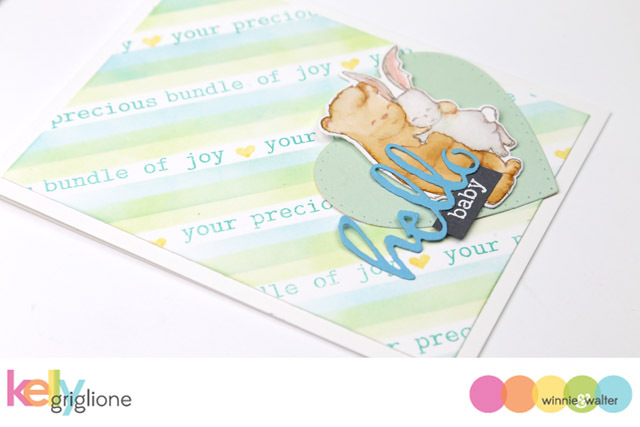 For this card, I put together a phrase "your precious bundle of joy" to stamp in between the inked stripes. The stripes were created by sponging ink through the Scenery: Classic Diagonal Creative Screening. I overlapped the two stripes to create a third color, which was nice since I only had to ink it twice. I'm always impressed with how well all the Winnie & Walter sets go together. 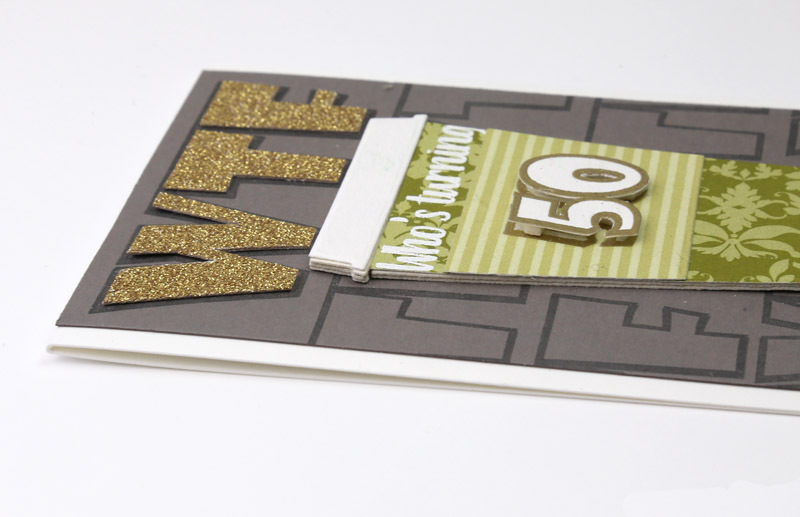 This card doesn't have a lot on it, but has two different stamp sets, three different cutaway sets, and one stencil. The heart with that cute dotted edge is from True Dotty Heart Cutaway. On top of the heart is one of my favorite images ever, from one of my favorite stamp sets Welcome to the Family with Evelin T Designs. The "hello" is from the Big, the Bold and Happy Cutaways, and "baby" is from the Big, the Bold and Baby. 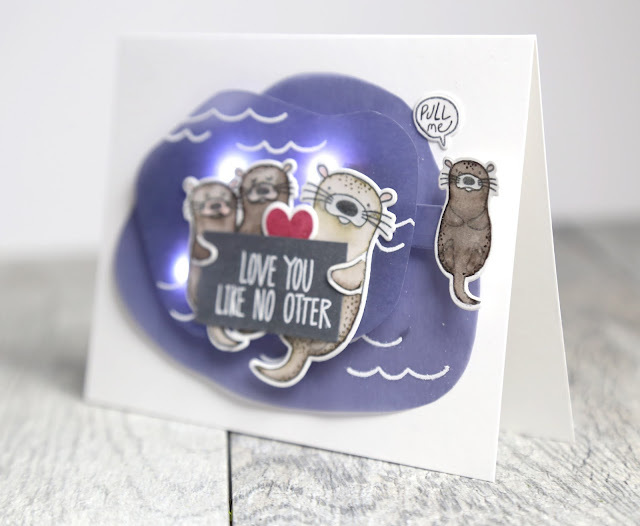 I played around with the embellishments after creating the background panel and ended up with a couple different versions of this card, because I really didn't want to cover up much of the background. This version with the watercolored bear and bunny pair is my favorite. Here's another version of the card, with a silver elephant and monkey on the heart. I went with this version when I couldn't get the above watercolored bear and bunny to look right. 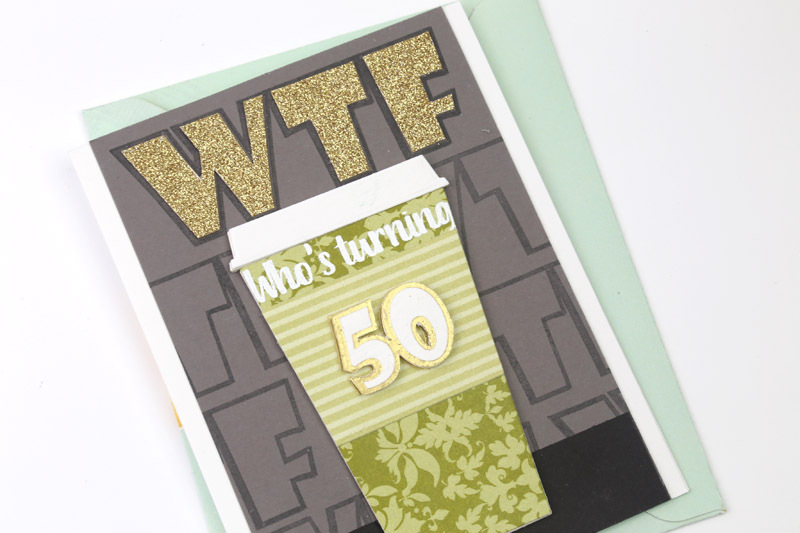 At the last minute I figured out that card was missing a larger sentiment which helped pull everything together. Be sure to check out the Winnie & Walter blog for details on how to participate in the monthly rerun challenge, and win a $25 gift card. Also, don't forget that The Big, the Bold and Baby is currently on sale all month! Hi Folks! I am very proud to be participating in the Stamping For Autism Awareness Blog Hop organized by my friends Tenia Nelson and Veronica Zalis to promote awareness for Autism. A dear friend of mine has a first grade son with Autism and I've seen her go through so many stages, including questioning if there was a medical issue at all, trying to get the right diagnosis, learning what it all means, advocating for her son with the school district, affecting change in the curriculum, and being on a constant search to find the best way to relate and communicate with her son as he grows. Promoting awareness of Autism will hopefully benefit my friend's son, and others like him, as they navigate their path, either through medical advances, or just through interactions with others in their community. The folks from the Chibitronics team thought it would be a great idea to literally light our cards up blue in honor of this hop! 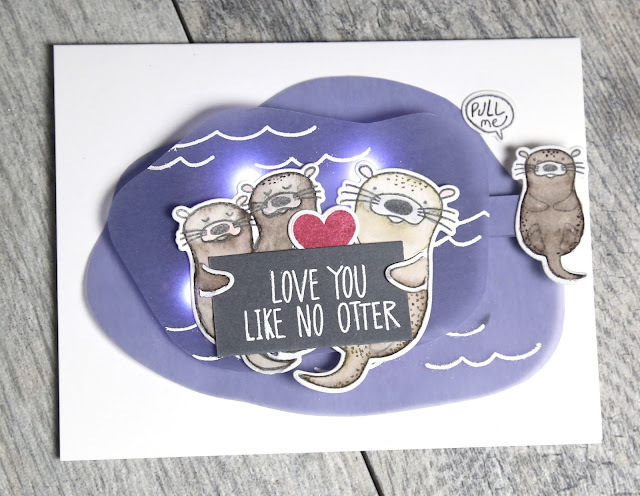 Along with the Chibitronics, I've used the Essentials by Ellen Otterly Awesome Stamp Set along with the coordinating die set and the companion Otter Ware Stamp Set to create a layered ocean scene that lights up when you pull the last otter to the side. Let's take a closer look! Here are the mechanics of this card. 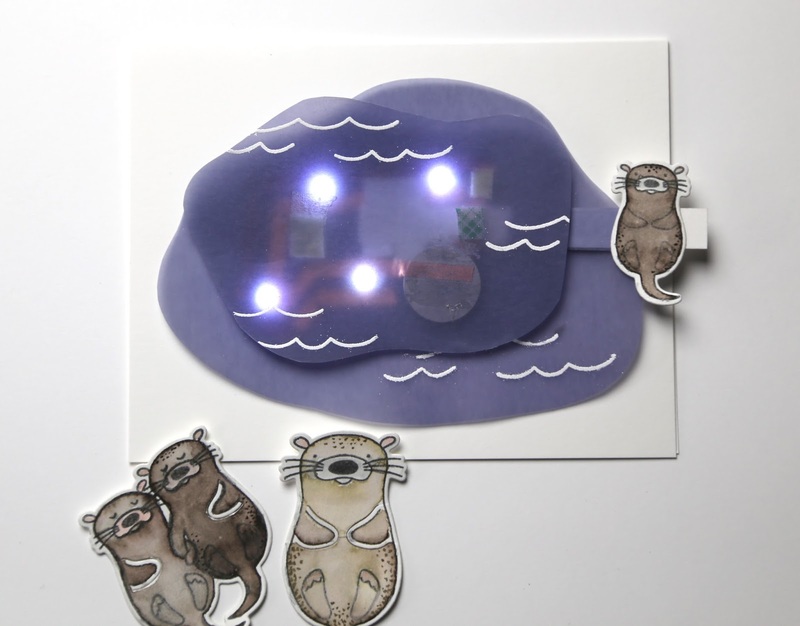 I added all the LEDs, copper tape and battery on top of the first layer of blue vellum (stamped with waves from the Otter Ware set). Constructing the card this way allows you to have more of a flat card, except for the middle that is popped up. The battery is adhered directly on top of the copper tape going to the narrow, negative ends of the LEDs, and the pull tab has copper tape wrapped around it so that when it's pulled (stopped by the perpendicular cardstock on the left end of the pull tab) the copper tape will bridge the gap and turn the LEDs on. I put a piece of foam tape (with the green protective sheet still on) on top of the wrapped copper tape so it will be pressed against the base and have a stronger, more consistent connection. 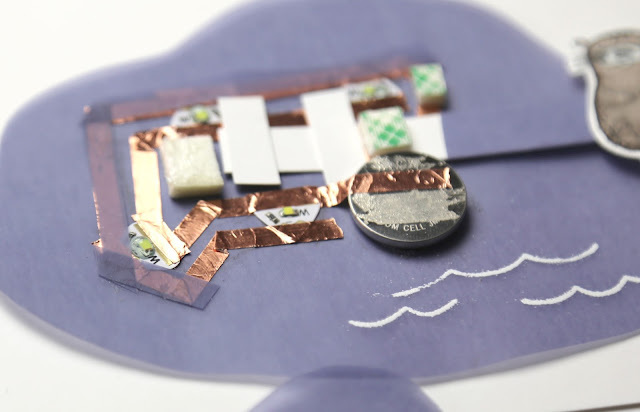 Then I added a second layer of blue vellum on top of the circuitry to hide everything, as well as to make the water scene more dimensional. For the copper tape that wasn't hidden by the otters, and would otherwise show through, I covered it with an extra scrap of blue vellum. The other copper tape I just left exposed. 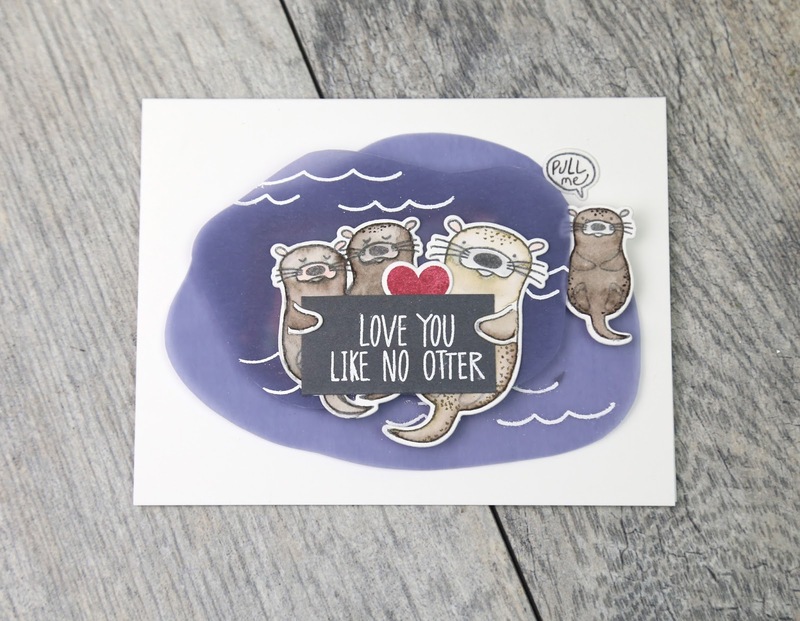 Then I added the otters, a punny sign, a heart, and a word balloon instructing the recipient to "pull me." The word balloon stamp actually comes with a tiny heart in the middle and two pointed ends, but I selectively inked the stamp to get rid of the tiny heart and the left pointed end, and filled in the gap with a pencil. Then when you pull the right otter, the lights go on, illuminating the sea! Here's a quick video so you can see the pull tab in action. Even not lit up, it's a cute card with four of the otters just hanging out.